Streaming movies from Netflix on the PlayStation 3 will soon no longer require a disc, and they'll also look and sound a lot better. Using Netflix on the PlayStation 3 currently requires a disc to be inserted, reportedly so that Sony could get around an exclusivity agreement that tied the streaming movie service to the Xbox 360. As of next week, the PS3 Netflix disc will become a miniature Frisbee, while the service itself will see multiple improvements on the Sony console. Netflix announced this week that starting on October 18, the "instant streaming" disc will no longer have to be inserted for users to be able to watch streaming movies on their PlayStation 3s. This isn't that big of a deal, because inserting a disc is about as easy as lifting your arm and moving it forward, but it's one less hassle if you've got a game in the system and don't feel like getting up to watch Willy Wonka and the Chocolate Factory for the 76th time. 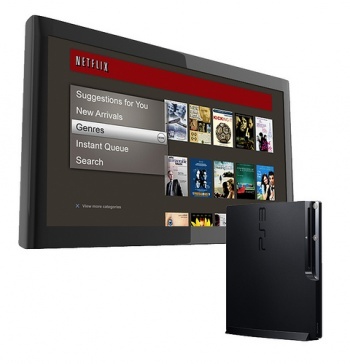 In addition, the interface used to access Netflix on the PS3 will be improved. The new interface looks closer to the one used for the PlayStation Store, and includes an improved content search feature and analog stick support. Netflix also says that playback will start quicker. The big news for those that own HDTVs or bumping speaker systems is that Netflix on the PS3 will soon support upgraded display and audio modes. Come October 18, 1080p playback will be available for content that supports it, as will Dolby 5.1 channel surround sound. This is said to be the first time Netflix will support 5.1 surround sound through streaming content on a console, but doesn't mean it isn't coming to the Xbox 360 later.